When you go to "Osaka Chakai" a Japanese tea room, you can choose not only tea but your tea cup. 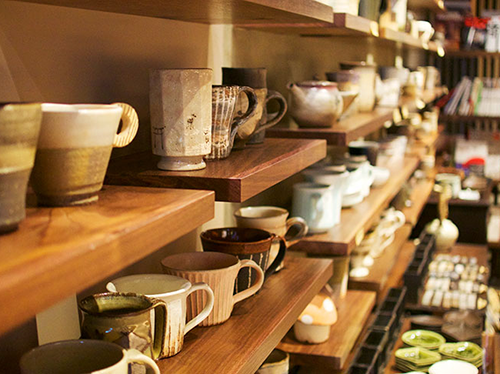 Their signature is freshly ground sencha. You can whisk your sencha with using a special bamboo whisk, which is fun. 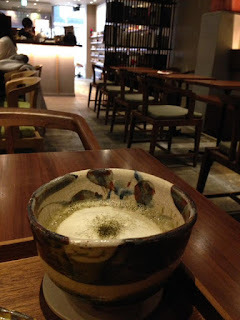 The other day, instead of ground sencha, I ordered hojicha latte. Usually, people choose a mug for latte, but I chose a matcha bowl. Actually, I am glad I did. I like the latte in a bowl. I had a slice of toast with roasted black soybean cream on it. I can say it is like peanut butter. 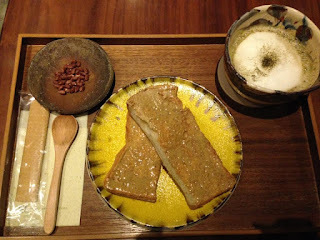 It was good with hojicha latte. This place has a lot of Japanese and I am sure you feel "Japan" a lot. When you happen to be in Osaka, why don't you visit? I am sure you will like it.